Reddit is about to get a huge new round of investment of up to £232 million, reports TechCrunch. The first $116 million is reportedly expected to come from the Chinese tech giant Tencent, the first ever Asian technology company to pass a $500 billion (£388bn) market value. The Reddit-Tencent marriage is complicated by the fact that Reddit, one of the most popular websites on the internet, is regularly – and is currently – blocked in China as part of the world’s most notorious and sophisticated censorship regime, the Great Firewall of China. Further complicating matters is the fact that Tencent is not merely a resident on China’s internet – the company is one of the most important architects of the Great Firewall. It’s an interesting source of cash for a Silicon Valley company whose product is essentially speech. 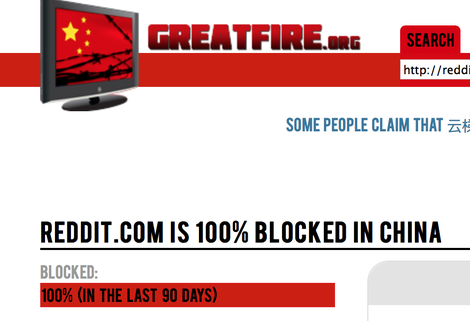 Censorship monitoring organisation GreatFire.org’s statistics on Reddit in China show that it has been 100 percent blocked over the last 90 days. If Tencent does kick in £166 million on a nearly $3 billion valuation for Reddit, as TechCrunch reports, it will be interesting if we ever find out exactly what it means. What kind of influence and position, if any, will Tencent gain at Reddit? Neither company responded to Gizmodo’s questions. “These days, I tend to say that we’re a place for open and honest conversations – ‘open and honest’ meaning authentic, meaning messy, meaning the best and worst and realest and weirdest parts of humanity,” Reddit CEO Steve Huffman was quoted saying last year in the New Yorker.